Trend Sniper Scavengers is an expert adviser which automatically open trades and controls them. It technically analyse the market and detect the starts and continuation of trends with an algorithm controlled by a combination of time-frames. 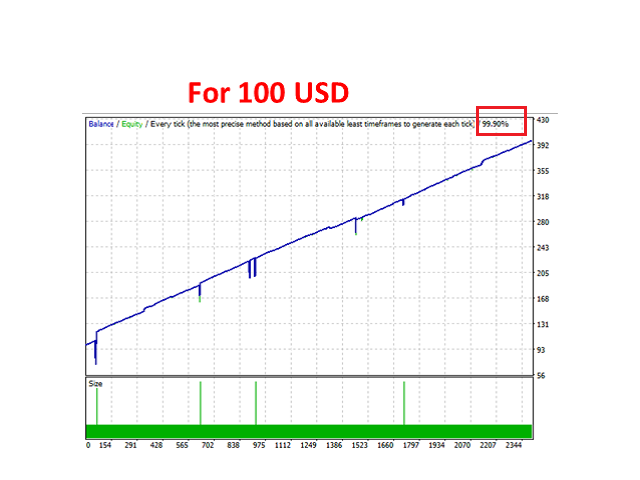 The robot is encoded with scalping and hedging strategies which make it 100% successful when its settings are well optimized for any symbol. The hedging trades have bigger lot size compared to the normal trades to quickly compensate for the loss trades. The robot provides protection to your account by controlling trades with your account margins. The hedging strategy works perfect for correct inputs. If you are finding it hard to optimize the inputs, please contact the technical team by leaving a message for the developer. They can provide you with the correct settings to match your account balance. Currency pairs : EURUSD,and EURJPY and any other currency provided the input settings are well optimized. The volume of trades (Fixed lot) should be changed together the LossMargin when trying to optimize the robot. Lot Value Mode: Select the mode (Fixed, Balance or Equity). If you choose Balance or Equity mode, the lotsize will be calculated based on those. Fixed lot: The fixed trading volume which the robot will use. Percentage of Balance: The percentage of your balance to be considered for calculating the lotsize for dynamic lot size option. It must be less than 10 percent always. Percentage of Equity: The percentage of your equity to be considered for calculating the lotsize for dynamic lot size option. It must be less than 10 percent always. UseOptimization: It must be set to true/false. It closes the trades when the negative trade reached the specified LossMargin. LossMargin: Maximum amount to lose on a negative trade. Amount should be in your base currency. Take profit: Take profit level in pips. For best scalping, it must be less than 20 pips. HedgeLotsFactor: The factor at with the first hedging trades lot size are more than the normal trades. Buy default, it work best at 1 for the recommended currency pairs. HedgelotMain Factor: The factor at which second hedge trades lot size is more than the first hedge trades. The second hedger trades are only opened if the first failed. Buy default, it work best at 1 for the recommended currency pairs. HedgingEntry: The amount in your base currency at which the hedging trades should be considered. It is the difference between the current trade loss and the loss margin. It must be more than 1. StopOutBalance: If your balance fall bellow the specified value the robot will stop placing trades. It must be in you base currency. CloseTradesOnMarketChange: Trades in losses may be closed close and sometimes hedging may not occur. UseStoploss: When set to true you can control the hedging trades with stop losses which are calculated by the robot itself. More trades and more profit. Upgraded to allow you to choose minimum balance (StopOutBalance) for the robot to continue trading. If your balance fall below the specified value the robot will no longer place trades.